How much do you love that A&E is all about Tony Soprano these days? Goodbye Law & Order, it's been great. It's not you, it's us. We've watched you all, like, going on 3 times now. And it's Tony. You understand. The new and series ending season starts soon and after a New Jersey town's board finally agreed to let them film the final scene in an ice cream parlor there, we've been thinking up the end. Will Tony get shot? Christuhfa? Can you tell we're excited? Anyway, Tony, er James Gondolfini, made Page Six today with this little bit. 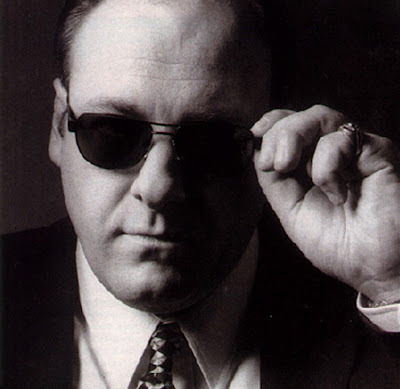 'AFTER six seasons playing Tony Soprano on HBO, James Gandolfini has picked up a few of the character's moves - including the ones he uses on the ladies. Spies at an after-party celebrating the series' final season at West 27th Street spot Guest House saw a smooth Gandolfini "pick up a girl Tony Soprano-style." According to a witness, he "chatted up a young brunette, led her to the dance floor and gave her a spin." A rep for Gandolfini said, "James was celebrating with his friends, family, and the cast and crew at the party."